Bald eagles are big and majestic, even the young ones like the immature bird pictured here. Who’s smart and cocky? That small black bird in the back: a crow pulling the bald eagle’s tail. Sometimes crows are a little too daring but this one is getting away with it. Potentially of some interest, based on geographic location, I would guess that the crow is a Northwestern Crow (Corvus caurinus). 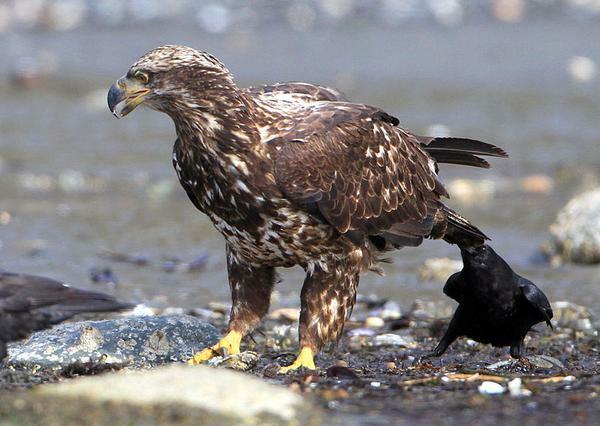 American Crow doesn’t occur in coastal British Columbia. I’d love to see a Northwestern Crow — it would be a lifer! Ha – love this photo! It made me think of Canuck, the crow in Vancouver, BC that has befriended his very own human, Shawn.